The year is 1771. Claire Randall is still an outlander, out of place and out of time. But now she is linked by love to her only anchor--Jamie Fraser. They have crossed oceans and centuries to build a life together in North Carolina. But tensions, both ancient and recent, threaten members of their clan. Knowing that his wife has the gift of prophecy, James must beleve Claire, though he would prefer not to. Claire has shared a dreadful truth--there will, without a doubt, be a war. Her knowledge of the oncoming revolution is a flickering torch that may light his way through perilous years ahead--or ignite a conflagration that will leave their lives in ashes. American author, Diana J. Gabaldon, grew up in Flagstaff Arizona, where her father, Tony Gabaldon, served as an Arizona State Senator for sixteen years. Author Gabaldon received degrees from Northern Arizona University, and the University of California. Her degrees were centered around Zoology and Marine Biology. She worked in the field of her degrees for several years, then decided to just try her hand at writing a novel. Gabaldon did research for her "practice novel" the old fashioned way, through reference books and periodicals......to quote her, "the Worldwide Web did not exist back then". After posting a short excerpt of her book on CompuServe Literary Forum, an author introduced her to a literary agent. He accepted the representation of this new author based on an unfinished first novel, which she had entitled Cross Stitch. 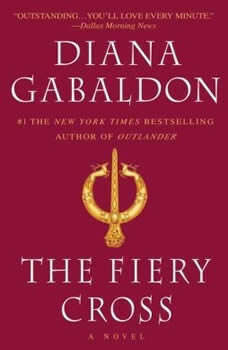 U. S. publishers changed that first book in a trilogy (that was required by contract) to Outlander. In 2014, the Outlander series was comprised of eight published novels. In August of 2014, the Outlander tv series premiered on Starz in the U.S.